Having a hypo can be part of the daily routine for someone who has the chronic disease of diabetes and that treats their condition with medication. Hypos are not safe and they’re not nice, I can tell you that from first hand experience. They’re very disorientating when they happen and can often leave you with feelings of exhaustion and frustration for a long time afterwards. But whilst I can try and describe to you what a hypo feels like, it’s a difficult experience to describe to someone without the condition. Until now, because innovative pharmaceutical company MSD have created a hypo simulator, that allows the viewer to see and imagine what it’s like to have a hypo! Hypoglycaemia is one of the symptoms that can occur as a result of the treatment used to manage diabetes. Although there can be more than two forms of diabetes, type 1 and type 2 are the main ones. In people with Type 2 diabetes their pancreas does produce some insulin, but not always enough and it can be controlled with diet and tablets. Insulin is the hormone that pushes the sugar derived from food- from the blood stream and into the cells that need it throughout the body. The cells are then able to use the sugar to help the body to create energy. Type 1 diabetes is a condition whereby the pancreas stops producing insulin altogether and the treatment for which is to inject the hormone instead. Both forms of diabetes can experience hypoglycaemia, however it is often more common in people who have Type 1. When there is too much insulin available in the blood stream, it results in not enough sugar being readily available for the cells to utilise and this causes the hypoglycaemia. Some of the symptoms of which are severe shaking, disorientation, sweating and sometimes blurred vision. Which when left untreated can result in the person collapsing and can even become life threatening. But before now, it’s been near impossible for someone without diabetes to understand what it’s like to experience having a hypo. However, the amazing simulator I experienced from MSD can create the experience of a hypo from the wearing of a very futuristic looking head wear device. Which was available for people to try at the European Summit for Chronic Disease. The hypo simulation begins with putting the viewer almost inside the body of the person with diabetes as they begin their daily routine. Soon they start to have a hypo and not only do they begin to shake and become dizzy, they begin to feel other symptoms that are described in shaky words on the screen. Perhaps most cleverly the simulator guides you through the diabetic's daily routine, so you can experience him trying to do every day things like put a key in the front door. But he can’t get the key in the key hole because he’s shaking so badly. Which happens to me all the time when I’m having a hypo and trying to focus on a task. You then see the man trying to use a computer, something that we all do everyday without thinking about. But he can’t concentrate on the keys because he’s disorientated or see the computer screen because he’s experiencing blurred vision. The concept of the simulator in my opinion was brilliant, because it bridged the gap between someone with diabetes and someone without. It was a great tool that finally allows us all to speak the same language and promote understanding between both parties. 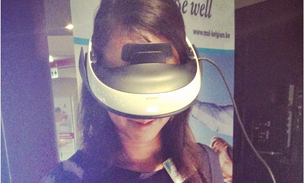 I had the pleasure of spending time alongside some of the many people trying out the simulator, of which there were numerous because people were really keen to develop their understanding of experiencing aspects connected with diabetes. One man tried the simulator and I asked him what he thought afterwards. The man said it was really good and most strikingly that he has a friend whom he’s known since childhood, who has diabetes. 'Wow' was his response, that ‘that’ meaning the hypo, was what his friend had been experiencing all these years; it was as though he finally understood what his friend had been going through with the condition. The man with the friend who had diabetes wasn’t the only one who felt the powerful impact of the simulator experience. Some people commented how frightening and scary experiencing a hypo likely was and some appeared to feel enlightened by the opportunity to see what it was like. Amongst the many visitors to the stand were James Reilly the Irish Minister for Health, the Bulgarian Health Minister and even the European Commissioner for Health Tonio Borg came and spoke to us about life with diabetes. It was wonderful to be able to join the experience of a hypo with the chronic disease that the Commissioner had been addressing us about over the event of the European Summit for Chronic Disease 2014! Simulation or not sharing the experience of diabetes is a big step forward in understanding and support of the condition, which was a key message that I took from the Summit. With many thanks to the International Diabetes Federation for supporting and empowering people with diabetes. And thanks to the pioneering pharmaceutical company MSD for creating the incredibly innovative diabetes hypo simulator and in doing so helping to bridge the gap between people with and without diabetes!